LG Optimus 3D review | What Hi-Fi? Even smartphones can't escape the clutches of 3D. 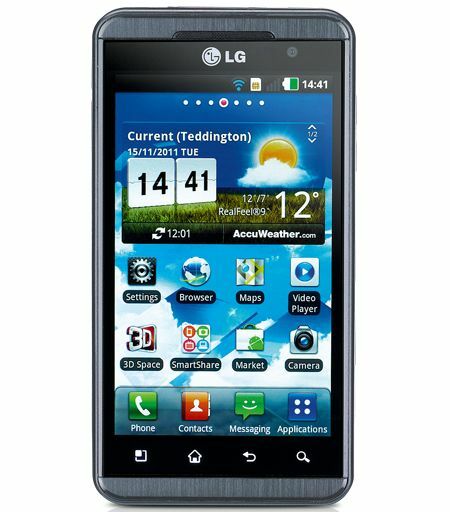 The LG Optimus 3D is the world's first 3D smartphone, capable of playing 3D videos and games, capturing your own 3D pictures and videos, and even sending 3D content to an HD TV. And all without the need for glasses. Three is the magic number here: elsewhere LG bigs up its "tri-dual technology", which should make it nice and fast, though it may be hindered by the Android 2.2 operating system, which leaves it a smidge behind the times. We do find moving around the interface a little less slick and a little more sluggish compared with the newer Android devices. Battery life is also an issue: this phone guzzles juice like no other and used heavily – playing 3D games, for example – it can drain the battery in a matter of hours. Thinner but bigger seems to be the trend for phones, and while the LG's 4.3in LCD screen makes it one of the most generous screen sizes around, it is relatively thick at 11.9mm. It's weighty, too, and does feel a little chunky. But that big screen is used well, allowing for an extra line of icons on the home page, with four, slightly fiddly, touch controls at the foot of the display. Elsewhere there's an HDMI output, which can send 3D content to a TV, DLNA and Bluetooth wireless connectivity and an SD card slot to boost the 8GB capacity. The ubiquitous dual cameras are both 5MP (lower than some) but one of those is the stereoscopic 3D cam'. It's surprisingly effective and a neat USP. Far from essential – but a sign of things to come? Quite possibly. Video and audio file support is good, with DivX on board and the familiar formats all supported. The 800 x 480 resolution screen looks like an LCD – bright with clean whites. This works well with web browsing, which itself is efficient. Watching video there's a lack of contrast and detail compared with the new breed of AMOLED displays and black scenes look gloomy. Motion, though, is smooth. Sonically it's a little muddled, with Drake's Headlines losing punch and purpose and lacking detail.